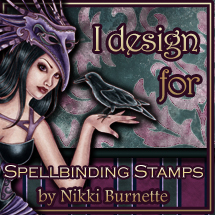 Today’s post is very bitter sweet for me as I am sharing my last project with the Spellbinding Stamps Design Team. I’ve had so much fun on this team and it has been a great experience for me as my very first Design Team. Unfortunately my promotion at work in December has lead to more work obligations and less time to work on all the DT projects. The past six months has flown by and I’ve learned a lot and had a wonderful time playing with all of Nikki’s beautiful images. I want to thank Nikki Burnette, Audrey and all of the amazingly talented DT ladies (Sharon, Samantha and Bettina) from the bottom of my heart for the opportunity on my first DT. Now on to this fun challenge. Today we’re celebrating Birthday’s. For my project I chose to use the lovely Kendall which is surrounded by it’s own frame with the dangling hearts and stars. Kendall looks to be dressed up for a party so I thought she’d make the perfect choice for a fun Birthday card. I’ll admit, I went a little off the rails with my color selection for this card, but I wanted bright, bold colors and that’s exactly what I got when I colored her up with my Copics opting for blue-green, yellow-green and hot pink. Wowza! I fussy cut her (OK – easiest image to fussy cut to date, LOL! ), keeping the frame and then layered her onto a die cut a pierced oval piece of cardstock in a coordinating color. For the background of my card I used a fancy die cut I’ve had for quite a while and this was the first time I’ve had the opportunity to use it. I think it really pulls the whole card together. Finally, I considered adding a stamped birthday sentiment, but then I remembered that I had this super cute Happy Birthday flag die that I got from a crafty yard sale one of my dear friends was having. Using some hot pink foiled cardstock I die cut the Happy Birthday sentiment and then added a bit of green cardstock behind it so it would pop with color. I added a few pink gems around the outer edges of my background die cut and voila! I think this is such a bright, fun card that would be perfect for a special friends birthday! I do hope you will join in on this challenge – play & have fun! Everyone’s in need of a birthday card from time to time so this is the perfect challenge to create some cards. Hop on over to the Etsy Store and take a peek at the beautiful images that are available (PS If you like coloring books she’s got those too). Be sure to share your creations in our Facebook Group and also on the Challenge Blog over at Spellbinding Stamps by Nikki Burnette. Again, it’s been so much fun getting to play and create with Nikki’s images. I hope everyone will continue to play in the challenges and support Nikki’s art through her Etsy store. Who know’s, you may see me guest designing down the road? I will still check in on the Facebook group from time to time to see what you all are creating. Thank you to everyone who’s followed along on my blog here. I hope you’ll continue to check back and see what I’m working on next. I’d love to hear your comments and feedback! Remember to do something crafty each day! Gorgeous coloring as always – LOVE your layering with all the die cuts? Thank you Carisa. I’m glad I finally had a chance to use my fancy Spellbinders die! WOW!! Your coloring is amazing! What a gorgeous card, and you did that image proud.